Enjoy the open-air spaces and laneways of Harbour Town Melbourne – home to a range of specialty stores and outlets, foodies, restaurants and entertainment. Located in the Docklands, Harbour Town Melbourne is easily accessible and is located right next to the Melbourne Star Observation Wheel and O’Brien Group Arena. Harbour Town Melbourne has commenced it’s $150 million re-development to reinvigorate the Centre. 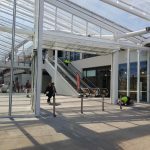 The Centre has already undergone a significant ambient and aesthetic refurbishment to create a comfortable, all-weather retail and entertainment precinct. This has seen the addition of bluestone and timber floors, a weatherproof roof structure and the incorporation of planting and laneway-style greening. 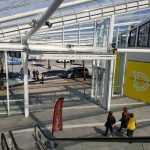 The ambience works continue with the Docklands Drive entrances currently seeing significant works to extend the weatherproof roof and add grand entrance doors. 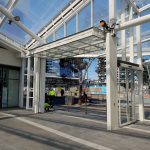 Mirage Doors were chosen to supply and install two 6.7M x 4.4M glazed S3000 Bifold counter weight doors as the main entrance doors to the newly developed precinct.